As with any sport, proper training is critical for optimum performance. 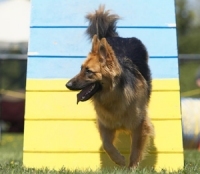 Agility is no exception! A good solid foundation of training is one of the most important elements of agility, and should not be overlooked. "Vision on the Rock is 2o2o"
Red Rock Agility is committed to providing the resources necessary to train properly on all of the equipment. Safety for you and your dog is very important to us. One of our favourite training facilities is Venture Stables, where we have the luxury of using a large indoor riding facility. Another key factor of agility training is FUN! This is an absolute MUST!! It is most satisfying to watch you and your dog learn and love this sport. You can choose what level you wish to take it to....a weekly outing with your dog, attending local demonstrations, fun trials, sanctioned trials, Regional events, National events, or even the World's!! Red Rock Agility trains the "trialing way", so you'll be ready if you choose! Be prepared for lots of FUN and PLAY with your dog! For further information on this great dog sport, or how to become involved, please email leah@redrockagility.com" OR frequently check the "Rock Reports" page for information on upcoming classes, clinics, and trials.